The USAA Rate Advantage Visa Platinum Card currently has an Informr score of 6 out of 10. This score is based on our evaluation of 9 sources including reviews from users and the web's most trusted critics. 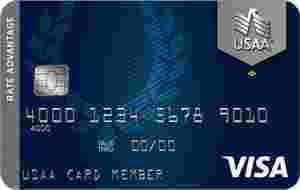 USAA Rate Advantage Visa Platinum Card is typically available to those with good credit scores (650 or greater). The USAA Rate Advantage Platinum Visa card has a lot going for it. It also has some excellent travel benefits, of the type usually reserved for premium cards. However, it’s biggest drawback is the lack of a 0 percent introductory offer for new and transferred balances. If you have military ties and a fair credit score, the USAA Rate Advantage Visa Platinum is a solid choice for low-cost credit improvement. And if you have good or excellent credit, it could provide a pretty low regular APR. But in any event, this offer won't wow you. USAA offers another solid card with the Rate Advantage Platinum Visa®, combining travel, identity protection, and shopping benefits with appealing finance add-ons for military service members. If you don’t use the rewards you’ve racked up on other credit cards and you resent having to pay a higher interest rate for a perk you don’t use, you may want to consider the USAA Rate Advantage Visa Platinum credit card. It’s a good low-interest-rate option for those who don’t care about rewards and who have a great credit score — especially for military personnel. You won’t get the rewards points like you will from the Cashback Rewards card, however you’ll receive the lowest APR around, enjoy some great benefits like travel and shopping perks, and appreciate the lack of fees including no annual, foreign transaction, or over the limit fees and no APR penalties on missed payments. Best for members of the military and their families, who typically carry a balance from month to month. If you have a high credit score and you want to leverage that score to get a low APR for your revolving debt, the USAA Rate Advantage Platinum Visa card is a solid choice. If you don’t plan on carrying a balance from month to month, you might be better served by a USAA card that offers perks like points or cash back. For those who qualify, the USAA Rate Advantage Platinum Visa offers one of the lowest variable annual percentage rates of any major issuer in the U.S., and it’s the lowest of any USAA card. The less money you’re paying on interest, the more you have to pay toward your balance. Designed for people who want to avoid paying big bucks in interest. The USAA Rate Advantage Visa Platinum Card lives up to its name where the interest rate is concerned. This card has a regular variable APR range for purchases, balance transfers and cash advances that’s highly competitive.